If you’re like us, we love family gatherings and the memories we make with our loved ones in our home. So if this is the year you and your family are considering some remodeling, here’s some fool-proof ways to make your kitchen even better for hosting friends & family! When rethinking your kitchen, look at refreshing your appliances alongside your cabinetry and counters. A double oven literally double the amount of available oven space for cooking for larger gatherings, a “family-sized” fridge makes sure you can keep all that extra food & beverages cold, a larger capacity dishwasher gets those extra dirty dishes clean, and a new oven hood can be a beautiful design element while also keeping smoke and odors out of your kitchen while hosting. 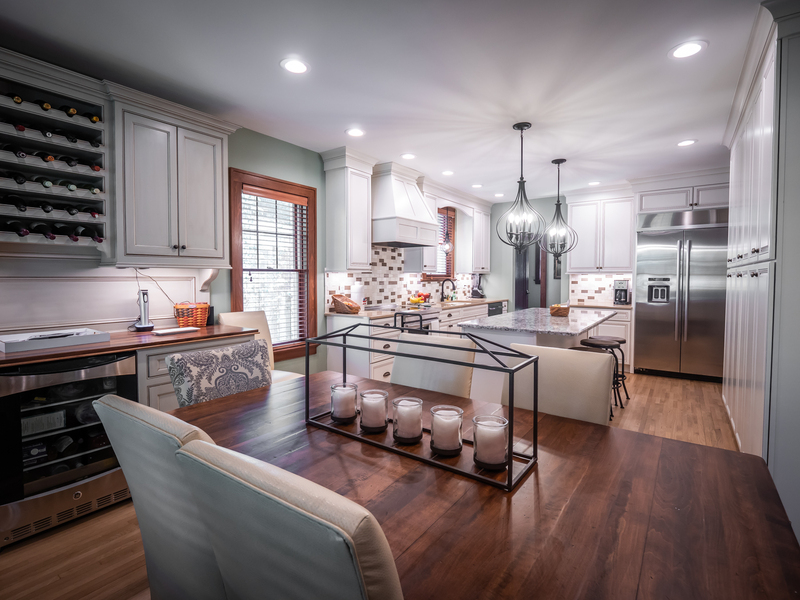 A new chandelier or overhead lighting is an easy way to add wow factor to your new kitchen, and it’s a great way to add artistic form to a primarily functional space. Also consider smaller lighting features: under cabinet lighting helps your new counters and fixtures standout to guests and family members alike, as do recessed lighting over sinks, wet bars, or additional countertop spaces. With the flooring industry continuing to produce a range of dynamic options for kitchens, the possibilities are endless to make your kitchen floors a beautiful focus of your remodeling project. Especially at family gatherings where young children are playing on those floors, you’ll want to make sure your guests don’t look down in dismay at what everyone is standing on. Finally, add a pop of color by adding an indoor/outdoor rug that’s durable enough for a kitchen setting, while introducing color and pattern to the room. Adding built-in seating to your kitchen adds comfort and functionality in the #1 place where people congregate during parties: the kitchen! We can help you decide on a number of seating options, including built-in benches, kitchen island seating, or bar tops.